One of the unique features of FinFacets’ offerings is its Actioning Team that works with Business Owners in their pursuit of achieving the organization’s goals. It comprises CryoFin™ Xperts, MIRB™ Xperts and SpyWeb Xperts. The Actioning Team ensures that Strategic Intelligence required by the Business Owners is made available to them in the Financial Portal. CryoFin™ Xperts are experienced professionals who are trained on FinFacets’ CryoFin™ platform. They work with MIRB™ Xperts to meet the intelligence requirements of Business Owners. The MIRB™ Xperts, who are CA/CPA/MBA (Finance) professionals with rich industry experience, work with Business Owners during the entire tenure of engagement. The MIRB™ Xperts team comprises a dedicated Point of Contact (PoC), a Consultant and a Principal Consultant. Coordinates with the CryoFin™ Xperts to ensure continuous update and maintenance of the Financial Portal. Requirement Assessment: Engagement of FinFacets team with Customer IT Team to understand the IT maturity of the organization, existing IT infrastructure and reporting requirements of Business. On-boarding of PoC: Appointment of a dedicated Point of Contact (PoC), who shall be associated with Business Owners for the entire duration of the engagement with the Client. CryoFin™ Configuration: Setting up of CRYOFIN™ engine and connection to various databases. Data-aggregation, Validation, Normalization and creation of a Unified Database. Strategic Intelligence (SI): Creation of cross-systems, “Beyond-ERP” reports, followed with Predictive Analytics and Competitor Analysis and making them available in real-time in the Financial Portal. Access Rights: Providing access to various Business Owners, based on pre-defined access-rules. 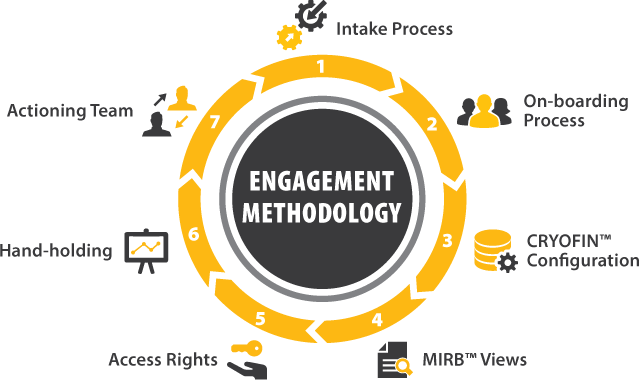 Hand-holding: Training to identified Business Owners to interpret the various analytical reports for Strategic Intelligence.